The University of the West of England (UWE Bristol) is taking a stand at the Affordable Art Fair to showcase the innovative work by artists working at The Centre for Fine Print Research (CFPR). The artists will be at stand B3 at the Fair at Brunel’s Old Station from Friday 8th until Sunday 10th September. Centre stage will be an extraordinary drawing robotic printer. 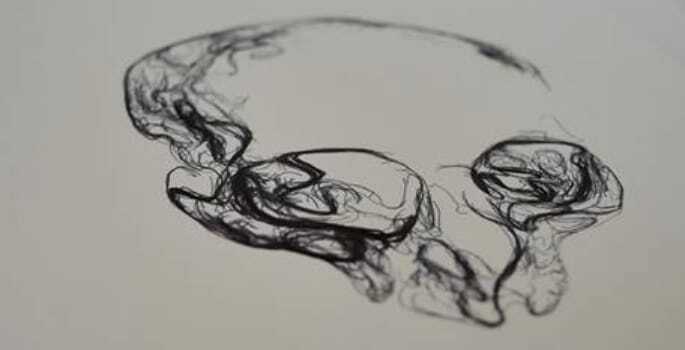 Paul O’Dowd, a roboticist and artist currently employed as a research fellow at CFPR, will be creating an edition of skull prints with rollerball pigment and the drawing robot. Paul explains, “I am challenging our expectations of what we can expect from digital printing by exploiting the physicality of the machine to add expressive qualities. Techniques from robotics stop a printer from moving in a consistent and sterile way and this pushes digital printing away from the notion of the perfect reproduction. Paul has drawn from research on handwriting, sketching, and other approaches that imply an imperfect personal touch, and has sought to elevate the physical imperfections of the machine and artist materials as a valuable contribution to the printing process. The result is digital prints that have a unique material quality and a striking machine-authenticity. The stand will include works for sale by a range of internationally acclaimed artists including colleagues from the Art and Design department Ian Chamberlain, Roy Voss, Kieran Brown, Richard Falle, Peter Walters, Paul Laidler, Arthur Buxton and Stephen Hoskins. The team at the CFPR are also working with the artist Sir Peter Blake on a number of collaborative projects including a limited ceramic edition with Burleigh Pottery and a 3D printed edition which will be launched in 2018. David Huson and Peter Walters from CPFR have also produced a bespoke 3D print for the band Radiohead. UWE Bristol has two stands at the Affordable Art Fair Bristol – as well as the Centre for Fine Print Research stand there will also be a stand of works for sale by UWE Bristol students. For more details of CFPR editions see here.